The brief was for three bed and breakfast units with an adjacent manager's residence connected by an enclosed deck. 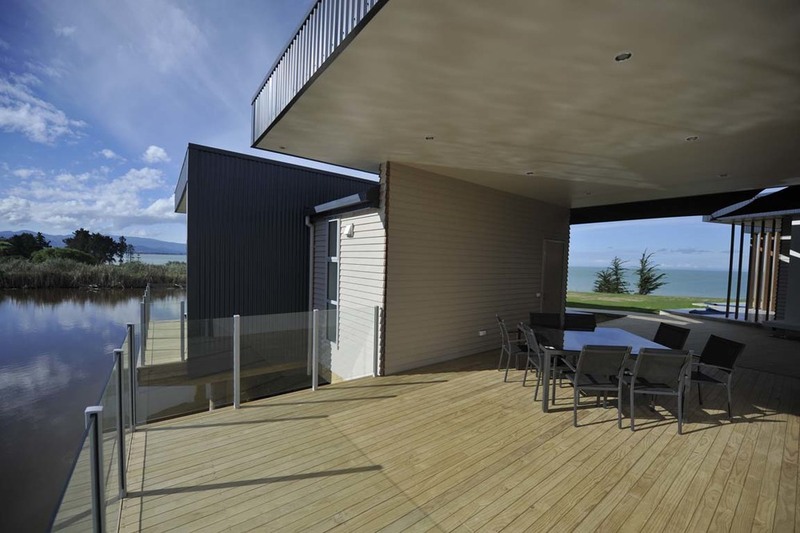 The site is north sloping and set among an olive grove with 180 degree views of Tasman Bay, Mariri Estuary and the Mount Arthur Range. There is also a pond surrounded by bull rushes and toitoi. The clients wanted a modern building that took advantage of all that the site had to offer. They also wanted rooms to cantilever over the pond as they look towards the mountains. The concept idea for the B & B units was of a series of modern boat sheds. They are separated from each other by smaller inserts housing the ablutions. The manager's residence is distinct from the units but ties in by using similar materials and design features. The connecting communal deck space acts as a transition zone between the two building types with the laundry/office building acting as the pivot.